This is the CPS sketch for the week and my version of it. 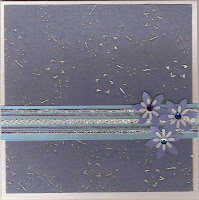 I started with another plan but, I didn't like the way it turned out so I started over, still using the blue color palette as this is a bridal shower card and I wanted to use the bride's colors. I hope I have some time this week-end as I really like this sketch and would like to try another card using it. Great use of that CPS sketch, love your card.